This past week I was thrilled/astonished/surprised/amazed to find a blow out sale happening at the daycare center where we take Red and now Twin Crazy and Twin Husky. They are completely renovating the space, and they are going “room by room”, ridding themselves of old, battered toys by selling them at HUGE discounts to the parents. Anyway, I’ve always been a big fan of creative arts activities for the kids. I’ve done this ever since Big Bro was a baby. There comes a point where kids just get bored and cranky and they need something to do. The kids would walk around saying “activity”, “activity”, and I knew I had to grab something to occupy them for 30 minutes or so. I’ve had bins and bins of all kinds of things for kids – mostly generated from ideas I’ve stolen from daycare centers. And there will be much more over the next several weeks…. 🙂 Yes, the stuff is battered. 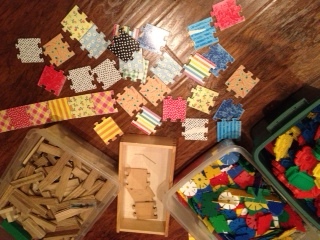 Yes, some of the pieces look like they have been chewed on or are missing parts. But they are new to these kids. And they are good toys to help them learn how to put things together, create something from nothing, work together, and yes…. negotiate with each other for the right pieces. I guess the point is that these kinds of things are great for kids and parents alike. You can sit down with your child and play, or take a break and watch them play with each other, or watch them parallel play. It’s all good. I spent time doing a bit of all three this weekend. When the kids arrived for their visit last night, I had some of these new activities set out for them and away they went… immersed. I played with Big Bro with “sight word” bingo while Twin Crazy and Twin Husky built things and played with puzzles. This morning all of the kids were fully entertained by themselves. 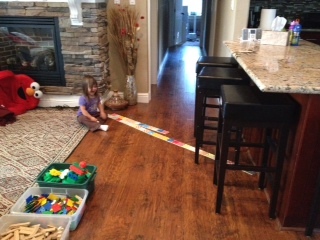 They were building “roads” with the pattern puzzle and cars with the blocks and using other toy cars. Big Bro was directing the play, of course. 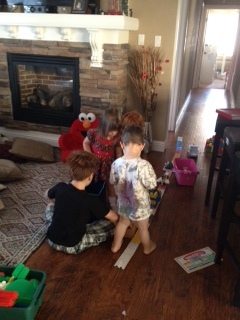 But they were all playing together and there were lots of sounds of pretend cars zooming around the house. And I got to sleep in a bit and hear them play from outside of my room. And this afternoon, I do not kid you, I had the neighborhood kids over and I’m not kidding, but including mine there were 10 kids here. 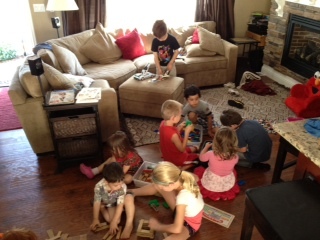 All playing EXTREMELY well and using their imaginations and playing together. And the little ones were learning from the big ones. 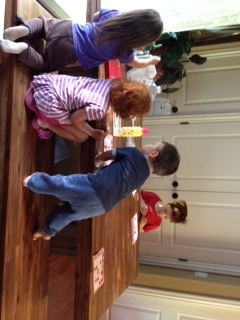 And as the kids played I cleaned up the kitchen and did laundry, just watching and laughing at their fun. It was actually relaxing. Yes, relaxing. 10 kids. Believe it or not. AND CHEAP. Where do you ladies find good deals on creative stuff for the kids to do? At our core, people are driven to create. I’ve often said to myself and others that having children is the best thing I have ever “did” in my life; in terms of doing something. Creating something. Bringing something to be that once was not. I still believe this to be true. I bet many of you do as well. Creating our children is probably the ultimate. And then there is our work. We create things there too. For me, I create ideas out of information – it is very abstract but it does come along with a lot of paper, PowerPoint presentations, and reports. Some of you may be like me, working in an office “creating” services or products that you really can’t touch or feel. Others of you may create actual, physical things. And then there is our down-time. We may not have much of it. You may have found that your free-time comes back as your children age. I find that the baby / toddler years are very demanding but as the kids get older you get some of your time back. But I’m finding myself with more and more of it lately for other reasons. I’ve been spending a great deal of this time organizing and re-assembling because of my move. But I’ve also been spending time tearing out my yard and yearning to build a garden. To create food from the earth. To see something grow. To see plants flourish. To see fruit form. I guess you would say that this is my new hobby – but one that I’ve been thinking about for years. For me, a part of the hobby is the relief and the physical part of tearing the weeds from the earth. Ridding my property of infestation of “yucky stinky weeds” as the kids call them. Taking something away that should not be. 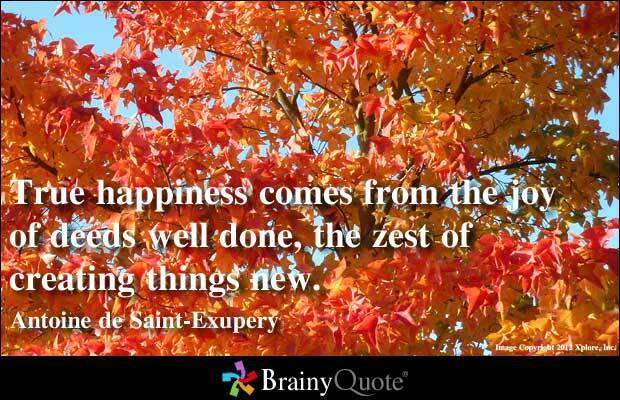 But then fixing the earth so that good can grow. I now have 4 trees that are planted in huge pots waiting for the right spots in the yard. I have strawberry plants that are drooping from their weight. I have corn stalks given to me by my neighbor. I have raspberry and blackberry vines thriving. I now also have a home full of houseplants – and I’m loving it. It’s a great release for me at this point in my life – a combination of physical and mental energy – a combination of taking away the bad to make room for the good. To create. To create good for the family. Which leads me to thinking… do you also find a cathartic calm from creating? What is your channel for this creativity? Please share!